Beside the daily tasks of my job (as checking the orders, contacting the customers for the overdue invoices and checking the new customers), I have additional tasks in my team, that are bringing diversity and new challenges every day. I’m also getting involved in the contests organized by the company and also in the extra activities organized with the team. It’s been a great experience working for Office Depot. I had the possibility to attend many trainings that helped me with my personal development. I met a lot of nice people, willing to help you, and I’ve shared a lot of happy moments with them. It is a nice working environment, with great leaders and colleagues. You keep learning, as time goes by, and you have also fun in this environment. New challenges make you want to achieve more and more. I recommend to people that I know to join the company, because in my opinion it is a place where your rights are respected and where you are also treated with respect. You can work in this environment even if you don’t have finance and accounting studies. All you need is the will, because here there are people who will give all their support to help you learn and grow. I like my job and its potential. 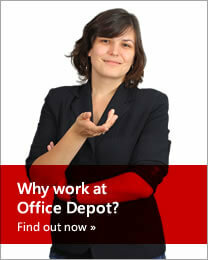 The words that describe the best what I do at Office Depot are: Taking care of people.